Albuquerque, NM — A pro-life group based in Albuquerque, New Mexico, has reported that a 27-year old woman suffered an incomplete second trimester abortion at the UNM Center for Reproductive Health that resulted in her hospitalization with a serious infection. 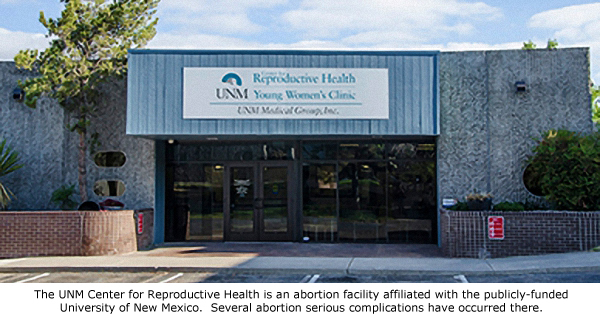 The UNM Center for Reproductive Health is an off-campus abortion facility operated by the publicly-funded University of New Mexico. UNM has recently come under fire from the House Select Panel on Infant Lives, which issued a 291-page referral letter to New Mexico Attorney General Hector Balderas, recommending criminal charges be filed against the University of New Mexico (UNM) related to the acquisition of aborted baby remains. On May 17, 2016, Patient A arrived at UNMCRH 19.6 weeks pregnant for a two day D&E abortion procedure. On this day laminaria was inserted into Patient A’s cervix for artificial dilation despite the fact that she wasn’t feeling well and her lab results showed that her white blood cell count was alarmingly high at 21.7. The website Perinatology.com states that a normal wbc count for a pregnant woman in the second trimester is between 5.6-14.8. An elevated white blood cell count is an indication that a patient has an infection, disease or weakened immune system. Patient A was already at a high risk for infection. Despite the fact that this patient had a compromised immune system UNMCRH placed performing the abortion above Patient A’s overall health and well-being. They proceeded with the second trimester abortion procedure, and dismembered the 19 week old pre-born child. Shaver wrote that immediately after the dismemberment abortion, and seemingly without checking to make sure the abortion was complete, an IUD was inserted into the woman’s uterus before it had time to heal. UNM conducted a study involving the placement of IUDs in immediately post-abortive or post-partum women that indicates immediate placement will save the patient money. However, placing a foreign object into a womb that has yet to heal from a nearly 20 week dismemberment abortion poses serious risks, especially in the case of this patient, who had indications she already suffered from an infection when the abortion began. Shaver went on to explain what happened after the abortion was supposedly completed. The very next day, after a restless night of sleep and increasing pain Patient A sought medical attention at UNM Hospital, where physicians that attended her suspected post abortion endometritis (an infection of the uterus) and an incomplete abortion. Patient A’s IUD was removed. She spent three days on antibiotics but on the fourth day her temperature spiked again and the UNM Family Planning Service division was consulted to provide a D&C to suction out any remaining fetal parts and or tissue. Once the D&C was performed on May 22, five days after her abortion began, Patient A finally began to improve. She was discharged from the hospital the following day. •	Ignoring the woman’s symptoms of infection and proceeding with a risky late-term dismemberment abortion. •	Failing to provide treatment or refer the patient for treatment of her existing infection prior to the abortion. •	Failing to make sure the abortion was complete. •	Inserting an IUD immediately after the abortion knowing that the patient was more susceptible to infection than healthy patients. Still unanswered is the question of whether the extracted remains of Patient A’s baby, who was one day shy of reaching the 20-week threshold of gestation, were sent to UNM for experimentation, as has happened in the past according to the investigation conducted by Select Panel on Infant Lives. Some have reacted with frustration to this latest botched abortion incident. “We know in the past that ambulances have been sent to UNMCRH on several occasions. Of course, that information is now being denied the public as is much of what The University of New Mexico does. What will it take for all interested parties (Regents, students, alumni, elected leaders) to wake up, speak up, and put a stop to a business that has been wounding women while making money aborting babies at every stage of pregnancy,” stated Fr. Stephen Imbarrato of Priests for Life. UNMCRH has stopped the practice of calling the 911 exchange for help when abortions there go bad. This was done to ensure that no publicly accessible record would be created that might expose the frequency with which their patients require emergency life-saving care. Congressman Steve Pearce (R-NM), was concerned that the state officials were doing nothing to provide even minimal abortion safety standards in a state where abortion laws are essentially non-existent. “I’m to the point where I’m saying that you must be approving of what is happening or you would be responding. New Mexico has evolved into the largest, the most abortion friendly state in the country right under our eyes and I for one do not think it’s appropriate,” said Rep. Pearce.